As much as I hate to think about summer coming to an end, it's about time to start making those back-to-school purchases. While school starts for us on September 8th, in many other areas kids are already back to school. Like many people, we start each school year with fresh lunch bags and backpacks (unless the old ones are still clean and in good shape). 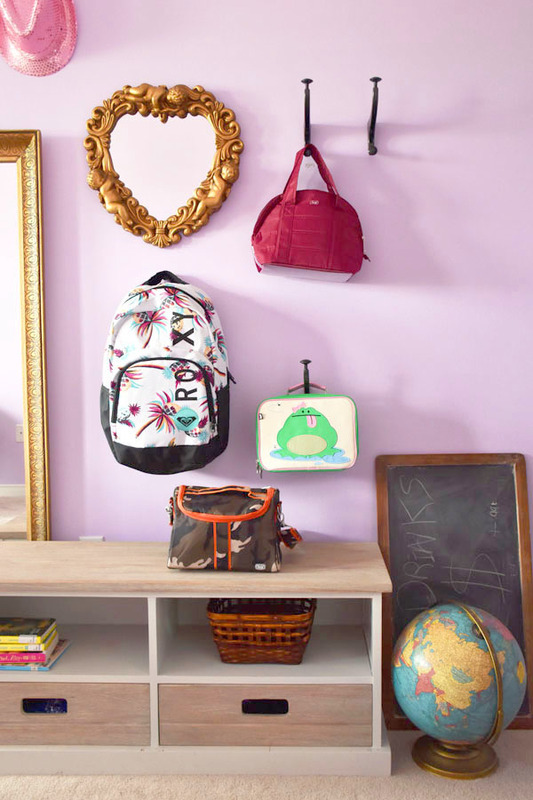 This year I did a lot of research to find eco-friendly and stylish options for lunch bags and backpacks that would suit our family. My daughter is 10 so she still likes the cute and fun options, but she also requires a certain level of "maturity" in her choices. My son is 13 so this in-denial mom has to be careful she doesn't go with styles that are too "little boy" for him. 1. Lug's Pedals Lunch Tote in cranberry red keeps food cool in its insulated interior. Store utensils and napkins in the exterior pocket. So important for a lunch bag - the material is fully wipeable and water-repellent for easy cleanup of spills. This pretty lunch tote comes in several colours and works for girls and women alike. 2. Available at Bentley, this Roxy Pineapple Print Backpack has the "cool factor" that a preteen or teen looks for. It's also big enough to carry all her stuff. This backpack has a main zippered compartment, an inside pocket and a front zippered pocket. The straps are padded for comfort. Plus, let's face it, it's just really cute! And it's on sale right now. Bonus. 3. This adorable Beatrix New York Katarina the Frog Lunch Box brings some cheer to your school day. It's insulated to keep food fresh. It's made with heavy-duty nylon and it's machine washable for easy cleanup (yay!). There's a name tag on the back so this little beauty can find its way back to its owner. Very important for kids - Beatrix New York lunch boxes are tested PVC-, phthalate-, lead- and BPA-free. 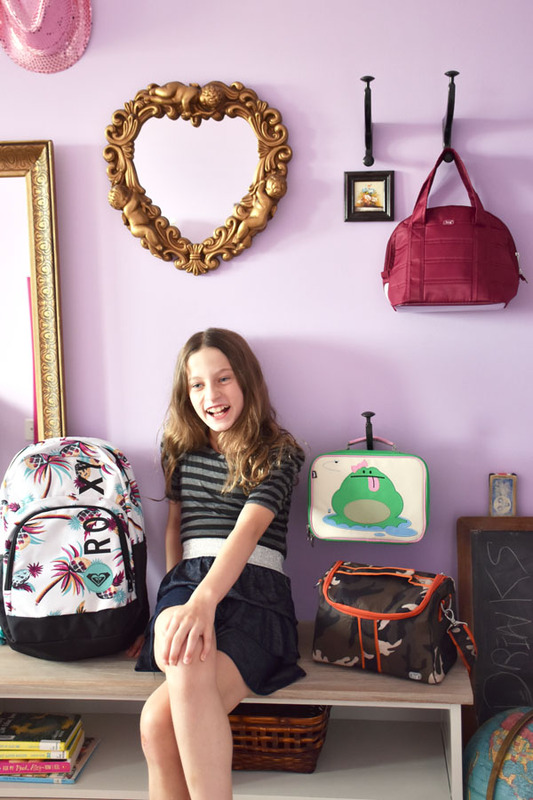 Find Beatrix New York's stylish lunch boxes and backpacks in Canada or in the U.S.
4. Another versatile lunch bag from Lug, the Tackle Box Lunch Tote in camo olive is suitable for anyone from a young boy to a grown man (or a girl who likes camo, of course!). It's a good size for a nice big lunch - it holds a standard sandwich container plus more small containers. The foil lining keeps your lunch hot or cold. Enjoy easy access to the contents with the wide-mouth opening. There's a detachable shoulder strap too. In addition to getting these stylish back-to-school essentials, we have also created new desk areas in both of our kids' bedrooms. I have posts coming up about those spaces. Of course, we need to get around to doing some clothes shopping as well. The first-day-of-school outfit is crucial, right? 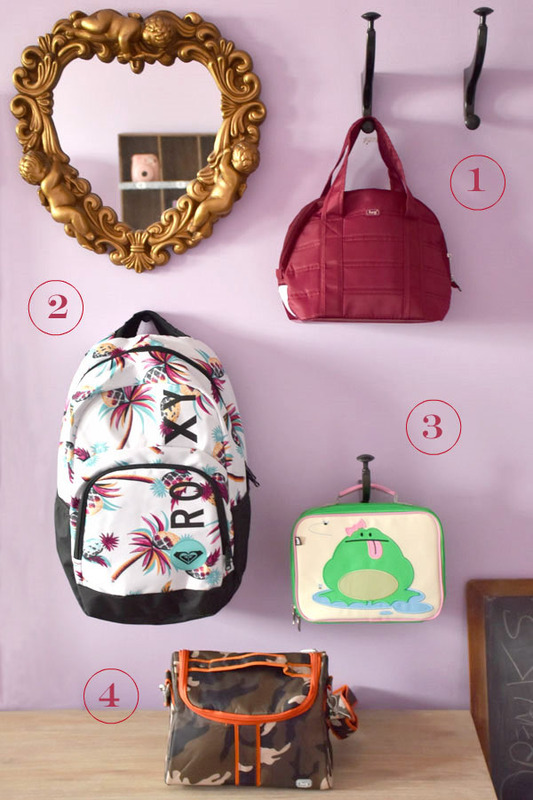 Have you done any back-to-school shopping? (Or fall shopping for those in a household where nobody's going back to school.) What did you buy? Enter to Win a $20 Starbucks eGift Card! My son is starting JK this year. We picked up a new backpack, planetbox, and new water bottle. Still need new indoor shoes. Yes I have went back to homeschool shopping. Picked up supplies and new shoes. Fun! I love fresh school supplies! I went back-to-school shopping for new clothes and new supplies. I haven't done any Fall shopping yet but I plan to in the next few weeks. have not done much. Did buy some clothes. I haven't done anything but window shop! We bought a few things for our grandkids when Target was going out of business here in Canada! School started 8-12 so I have been done! I have done no shopping. Yes, I help buy for all the grand kids. I love taking them shopping. Where we live, you can get a list from the school, or on line, what supplies they need. Everyone always gets a new backpack. I have some done. I've gotten paper, notebooks, pencils and shoes. I haven't done any shopping as of yet. Just clothes. Lots more to do! I bought office supplies during back to school just because! No I haven done any back to school shopping! No I have not done any back to school shopping yet. I have not done any back to school shopping yet. Will have to get on that soon!! Eeek! I think all our school supplies are purchased !!!!! I haven't yet, but my kids need boots and socks. I am a retired teacher, so I don't require back to school things, but I had a fun shopping trip for my son and daughter-in-law (both teachers). It is a lot more fun to star a school year when one has fresh things with which to begin. We have purchases some t shirts and a backpack so far. Annabelle would love that backpack! I am the mean mom who is making her wait until middle school starts next year for a new one! haha! We have gotten all of our back to school shopping done as of last week. We have to be early about it since both my husband and I go back to teaching at the same time, too. My whole house empties 9/9 when we all go back. It's a hot mess around here this time of year. I haven't done any fall shopping or back to school shopping yet. I guess I am behind. Yes, got new clothes and binders. we haven't started the actual shopping but we have been making a list! yes,I have some done,but need to do more. I bought some clothes and shoes for my son. I refuse to let go of summer so I haven't done any fall shopping yet! Yes we are pretty well done all our back to school shopping, & the grand total so far is around $750 which is ridiculous. 4 pairs of shoes, coats, backpacks, supplies, clothes... ugh it's so crazy at this time of year! Yes, we are doing lots of back to school shopping. Jeans and school supplies are done but I still need to buy shoes. We have started our shopping and have gotten school supplies, backpacks and clothes. We haven't started yet. But soon I'll buy some (home school) supplies. I have gotten some of the clothes and shoes shopping out of the way. we have only done minimal shopping as we try to keep it spread out so it isn't a mad rush. I'm a teacher, soooooo I bought back to school clothes!!!!!!! And of course a few classroom goodies like a beanbag for my "listening station" area! I've finished all my BTS shopping. I bought new clothes and new school supplies. No, we don't have to do back to school shopping in our household anymore, and we also haven't done any fall shopping. I have done all my back to school shopping. I bought school supplies pens, pencils, backpacks, shoes etc. I have done some back to school shopping. I have gotten some shoes, school supplies and one backpack. I'm hoping to finish this weekend! I have bought most of my daughter's school supplies but have not gotten new clothes for her. Yes! Lots of Hillroy notebooks! School supplies and some clothes for each of my 3 kids. I just bought a ton of new clothes for my husband! I just bought a new pair of boots. I think I might need some long sleeve t shirts too though. I went BTS shopping for my son. I got him, shorts, shirts, pants, shoes, under clothes, back pack and school supplies. I am avoiding back to school shopping but need to shop for my 3 school aged daughters. Maybe next week as school doesn't start until September 11. I haven't done much shopping yet. Waiting for the next weekend .. hope the sales really kick in! i picked up a nice backpack for my son. Our kids started back to school way to early this year, bummer. We bought supplies and some clothes. I still need to get them a fall jacket. I have not done any fall shopping. We have the school supplies all done. My son has outgrown everything though and we haven't done any clothes shopping yet. He starts on the 9th so we will be hitting the mall this weekend. No one here is heading to school. It's just a regular week for us. No fall shopping yet, but hope to do some shopping real soon. I've finished all the shopping. Bought all the school supplies, a backpack, fall jacket and runners. I have bought some new tops. All the school necessities...sneakers, jeans, tops,jacket, dresses etc. I bought so much! School supplies, backpacks, lunch bags, shoes, clothes...it's amazing how much it takes to get kids ready to go back. I bought new sneaker and some clothes for the Grandchildren for back to school. We did the usual backpacks, shoes, clothes and school supplies. Super easy this year for back to school shopping. Just had to buy a backpack, lunchbag and school shoes. I bought new backpacks, lunchbags, shoes and school supplies this year. I brought a bookbag and tons of school supplies for my teenage son. I can never go over how much money you can spend on paper and pens this time of year. i did all of my daughters back to school shopping all ready. we got her a new backpack and school clothes. we had almost everything he needed.